Hotel Delfino is a luxurious four-star hotel resort on Isle Delfino. It is located on the island's south-west coast, and serves as the pivotal location in Sirena Beach, the sixth world of Super Mario Sunshine. The hotel is owned and managed by a Pianta, the Hotel Manager. Mario visits this place in search of Shine Sprites. At noon, prior to Mario's arrival, the hotel got attacked by a creature called Phantamanta which covered the premises in turquoise, electric goop and made the hotel vanish. Mario arrives at sunset during another attack of the Phantamanta, which allows him to battle the creature and free the hotel from the goop. After that, the hotel itself becomes accessible. Mario has to deal with a massive Boo infestation inside the building. In search of Sirena Beach's Shine Sprites, he has to circumvent the hotel's security system, battle Boos in the foyers and the attic, and use hidden pathways and portals to get from room to room. The source of the ghost invasion is eventually located inside the hotel casino. Here, Mario battles King Boo beneath the giant roulette wheel. Mario's quest in Hotel Delfino then comes to completion with a Shadow Mario duel and a final Red Coin hunt through the various hotel rooms. 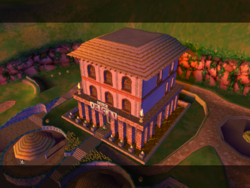 By design of the developers, the player cannot leave Hotel Delfino through normal means once entered. The building can only be exited either through collecting a Shine Sprite or using the "Exit Area" command from the menu. A similar case occurs in the hotel casino. The hotel building is composed of three regular floors, two basements, and one attic floor. The first floor serves as the lobby, with a reception desk, a small kiosk serving fruit, and two guest restrooms. The second and third floors are reserved for guest rooms, as well as storage rooms. The doors leading to those rooms can be locked. Some of the rooms are also interconnected through passages behind furniture. There is also a spa located on the third floor which under normal circumstances requires appropriate swimwear to be entered. The entire building is equipped with a security system, referred to as the auto-lock system. It activates in cases of emergency and makes the stairs connecting the different floors inaccessible with massive shutters. 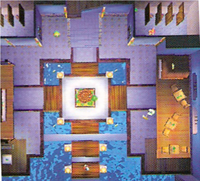 The premises of Hotel Delfino include two cabanas serving fruit cocktails, as well as some fountains, and a sun deck from which guests can enjoy scenic sunsets, as advertised in the Isle Delfino guide. When viewed from above, the fountains, torches, and huts are reminiscent of a Nintendo GameCube controller. Casino Delfino is a sub-section of Hotel Delfino. It features two jumbo slot machines and a tile set which can be operated through spraying them with water. There are also other, smaller slot machines from which coins can be obtained through a Ground Pound. A giant roulette wheel makes up the center of the casino hall. The music of Hotel Delfino features rhythm ukulele, electric bass, and various percussion instruments, including bongos, congas, güiro, marimba, vibraphone and wooden wind chimes throughout. A theremin-like synthesizer comes in and out with the melody. The casino's music is completely different; rather, it implements saxophone, honky-tonk piano, electronic organ, upright bass (pizzicato), whistling, and a drum set. 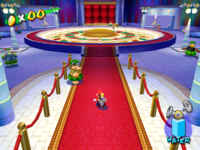 The same casino music can be heard in Luigi's mini-games in Super Mario 64 DS and New Super Mario Bros., but without the ones as mentioned above. Although Yoshi does not appear in the casino, a version of the Casino Delfino theme music with Yoshi's bongo drums exists in the game's coding. The Hotel's Japanese name, along with that of Casino Delfino, are the only instances of the word "Delfino" in the Japanese edition of Super Mario Sunshine, outside of the opening cutscene, where the English voices are used even in Japan. This page was last edited on February 16, 2018, at 20:00.